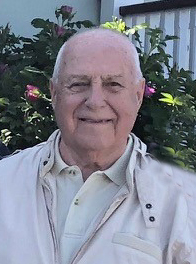 Raymond G. Gagnon, 92, of Saco and formerly of Biddeford died Friday, January 25, 2019, surrounded by his loving family. Born September 13, 1926 in Biddeford, a son of Adolphe and Delvina (Canuel) Gagnon. He was a 1947 graduate of St. Louis High School and served in the US Navy Seabees during WWII, stationed in the Philippines. On April 19, 1954, he married Estelle L. Cartier at St. Andre’s Church. Raymond was a self-employed barber for 54 years at his Elm St, Biddeford location. He was a member of the Maine State Barber Board from 1967 to 1977 where he served as Secretary-Treasurer. Also a proud member of the State Barber’s Union for 25 years serving as vice president and president and the Maine State Barber Board serving as its Secretary-Treasurer. In 1971 he was elected barber of the year. Raymond had also been an independent real estate broker for several years. Raymond was very active in his community. Helping others was second nature to him. His service included: City Planning Board from 1966 to 1980; the St. Joseph’s Parish Cemetery Committee for 22 years; parish offertory collector; 50 year volunteer for St. Vincent de Paul Society; member of the St. Jean the Baptist Society; and lifetime member of the Elks. Raymond was a Charter Member of the St. Joseph’s Credit Union, serving on the Board of Directors from 1963 to 1983 and in numerous other capacities for the credit union until his death. Preceding him in death were his wife, Estelle, 2005 and his brothers George H. in 2009, Robert in 2013 and Donald in 2017. 2 Sons: Marc R. and wife Susan of OOB & Zephyrhills, Fl. 6 grandchildren: Bill and wife Kristen, Andy and wife Liz, Olivia, Ellie, Maria and Joshua and wife Sara. Visiting Hours will be from 4:00p.m. to 8:00 p.m. on Monday, January 28 at Hope Memorial Chapel, 480 Elm Street, Biddeford. A Mass of Christian Burial will be held at St. Joseph’s Church, Biddeford on Tuesday January 29 at 10:00 a.m. followed by burial in St. Josephs Cemetery. Contributions in his honor can be made to the Raymond G. Gagnon Scholarship fund at Peoples Choice Credit Union, 73 Industrial Park Rd., Saco, ME 04072, or to St. Vincent de Paul Society, care of the family. For online condolences, please visit www.HopeMemorial.com.